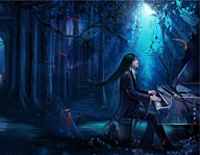 Undead Piano EOPM is provided for you and if you think it can be optimized such as adding the dynamics etc, welcome to provide us with the more perfect Undead Piano EOP and EOPM! Undead Piano is an original work created by Internet friend Daddy Long Legs. Actually this song was written after he watched the independent horror film Saw.